Since October last year, I have had the pleasure of working with Ignite Research - a group of thinkers and researchers understanding consumer behaviour. The team is beyond curious and approaches projects with a fresh view to gain the most insight. For many, consumer research is simply viewed as a tool of validation - proof that something worked in the past rather than a process to gain insight which informs strategy and idea development. Gaining an understanding of what people are into can inspire new ideas which truly have an impact on people. This week, Ignite launched their latest experiment the ig score. This is a measure of news and brand stories which have an impact on Irish people. Similar to Ev Williams views on readership and attention metrics, we have challenged the status quo that awareness is the key metric in measuring success of campaigns. Awareness is nothing without a measure of effect. 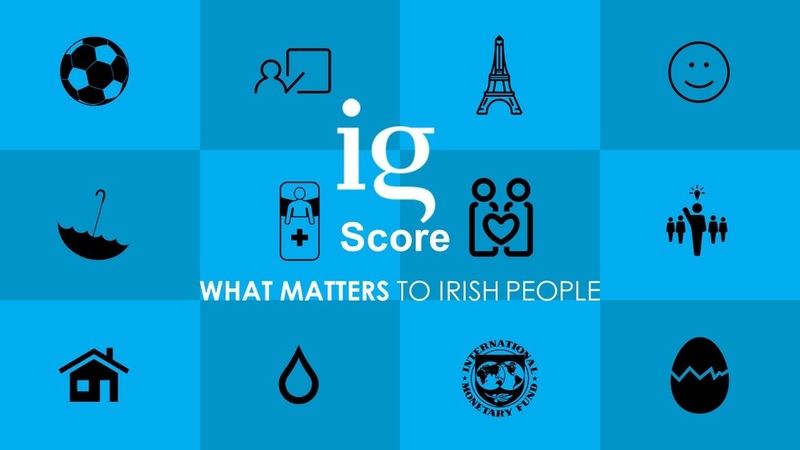 The ig score will provide a scale of the things which matter to Irish people. Over time, this will help organisations respond with communications, products or services which have an impact. What really matters to Irish people? What has the great impact on our lives? You can view the research at igniteresearchlabs.com/igscore and sign up for other reports on the site.